I attended the program Scott Kunst owner of Old House Gardens presented last week at the Toledo Botanical Garden. He sprinkled his informative talk with humor and personal anecdotes. It was well worth the time spent. During one part of his talk on backyard garden architecture , Scott mentioned the fact that there was one original chicken coop left in the city of Ann Arbor. He showed a slide of the structure that was located in someone’s backyard on the Old West Side. Off-handed he mentioned that there was also one original outhouse left in Ann Arbor. As soon as Scott said that, I turned to Otto sitting next to me and related a story to him about an experience Judy and I had about 15 years ago. At that time Judy was designing and maintaining gardens for folks in the area. One of her clients had a house in the Old West Side neighborhood. Harold was his name I think. Harold was in the middle of re-planting part of his backyard. He asked Judy to move a lilac bush that was in an unusual spot in the yard. She agreed and asked me to help with the heavy digging. We carefully dug out a good sized root-ball and lifted the plant out to be moved. While digging the last few shovelfuls of dirt out of the hole, I found a marble…then another and another until I had found five marbles. What we were digging in was the location of a long-forgotten outhouse! I surmise that when indoor plumbing was installed, the owners tore down their outhouse and planted that lilac over the pit. This was a very common practice at that time. I’m guessing the marbles we found decades later must have been lost by a boy who had the marbles in his pocket when he went to occupy the outhouse! Did he know where he lost them? Probably not. Maybe his sister decided to exact revenge on him for teasing her so much. We’ll never know for sure. The “night soil” had long been turned into rich humus by soil organisms. The lilac roots had penetrated the old pit and the plant was fertilized for I don’t know how many decades before we arrived to move it. I kept those marbles all this time and never really had a chance to show them to anyone until now. E-e-e-w-e!! I can't believe he's holding them in his bare hand!! Those are the actual marbles dug up that afternoon. I never used to like squash. We never had it when we were growing up. I don’t know what it was, but something happened in the last couple of decades that made me appreciate squash and now we eat it regularly. Squash is a very nutritious food and is easy to prepare. Most of the time I just cut one in half, take out the seeds and bake it in the oven until it is soft and tender. What I’m talking about here is winter squash as opposed to summer squash such as zucchini. This past fall I started an informal experiment to see how the different varieties of winter squash hold up under our storage conditions. The place I keep our squash ranges in temperature from 40F to about 50F depending on the outside weather conditions. I don’t do anything special to them. I just put them into a crate and take one out when I want one. I have in storage eight different varieties of squash, four crates in all. After going out the other day to get a squash to bake, I thought “h-m-m-m-m some people might be interested in the results up to this point”. Now we are into the third week of February and I see that the Kabocha squash has deteriorated the most. It has areas of deep spoilage. These spots can be cut out and some of the squash can be used. The Buttercup appeared to go down hill fairly quickly. Last month I noticed that most were starting to get a little rotten right in the “cup” of the but the rest of the squash was perfectly fine. The Butternuts are getting shriveled and some have very soft spots. The Acorns are firm but have some isolated bad spots that can be cut out, the rest of it is usable. There are some surface spots on the Spaghetti Squash but they are otherwise OK.
No spoilage is evident on the Hybrid Acorn. I haven’t tried to eat one of these yet. Neither the Baby Hubbard nor the Blue Hokkaido show much in the way of loss of quality. 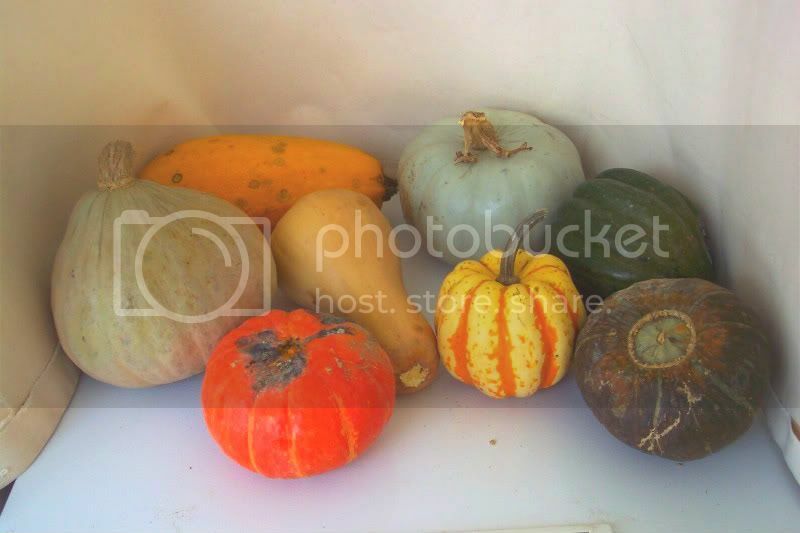 One thing has to be done if you want to keep these for the winter; pick unblemished squash. Be sure they are not bruised, cut or have any other suspicious marks on them. If they do have spots on them, eat those first before spoilage sets in. For flavor, my favorite is Buttercup. They are so flavorful that you think they already have butter and sweet spices mixed in. So, there you go, lots of great food stored through winter with no canning or freezing. Now if anyone has any recipes…. Tired of these gray days? Would a stroll through some old-fashioned gardens perk you up? You won’t be able to actually physically walk through a garden but will be able to learn about them in a program presented by Scott Kunst owner of Old House Gardens. He will be speaking at the Toledo Botanical Garden this coming Wednesday, February 17, 2010. I met Scott back in 2001 while picking up an order of antique Dahlias from his place of business in Ann Arbor. I can tell you he is a very personable guy who, over the past couple of decades, has become an authority on the subject of historical bulbs and gardens. The Dahlias I was picking up back then were ‘Bishop of Llandaff’. The bright red flowers of these dahlias are nicely set off with a beautiful bronze foliage. I have saved and stored those dahlia tubers ever since. That is the subject of another post however. From the scanty pioneer gardens of the early 1800s through flamboyant Victorian carpet-bedding to the “old-fashioned” perennial borders of the early 20th century, “Antique Gardens” illuminates 140 years of American yards and gardens. In colorful, fast-paced slides, it shows how plants, outdoor furnishings, and the design of American yards changed dramatically through the years. It’s an eye-opening primer on the landscape relics that survive all around us and essential background for gardeners wanting to restore a historic landscape or to enliven any garden with a touch of the past. The program begins at 10:30 am in the Crosby Conference Center at the Gardens located at 5403 Elmer Drive (south of Central Avenue). This promises be a welcome gardening diversion from the long stretch of cold weather we have been having. More is involved in starting seeds than popping them into potting mix and letting them go. Some species of plants need to have special requirements met before their seeds can germinate. Take for example Canna seeds. Yes, I know that Cannas are normally planted as bulbs (tubers) in the early summer. However some varieties of Canna are available in seed form. Thomson and Morgan offer their own hybrid variety as seeds. Anyway, Canna seeds have an extremely hard seed coat that makes it very difficult for the seed to absorb the moisture needed for sprouting in a timely manner. Canna seeds are also known as “Indian Shot” because they resemble the BB’s used in shotgun shells. As a matter of fact, because they are so hard and dense, at one time they actually were used in shotguns when lead was in short supply. In order to deal with these difficult seeds, horticulturists have learned that if you “nick” or sand down a small part of the seed coat, water will penetrate the seed and stimulate germination. This “nicking” process is known as “scarification”. I scarify seeds by rubbing them on sandpaper until a small spot on the seed coat is worn away and you can see the lighter color of the seed underneath. Don’t get carried away though, if you sand too deep, you may damage the living embryo inside. I haven’t found a really good way to hold the seeds other than with my fingers. Don’t be surprised if some of your fingernail is worn down in the process. Using sandpaper to scarify seeds. Once your seeds have all been nicked soak them in warm water for about 24 hours. Keep the water warm for the entire soaking period. These seeds then need to be planted into a potting mix immediately. Once they have been treated by this process, they will not keep. I suggest you start your Cannas soon. They will need a pretty good head start if you want them to bloom this coming season. By the way, after this summer is over you can dig the tubers from these plants and save them for planting next year just like any other Canna.